The Mast General Store in Greenville is partnering with Loaves & Fishes this February 10 and 11 to restock their food pantry. 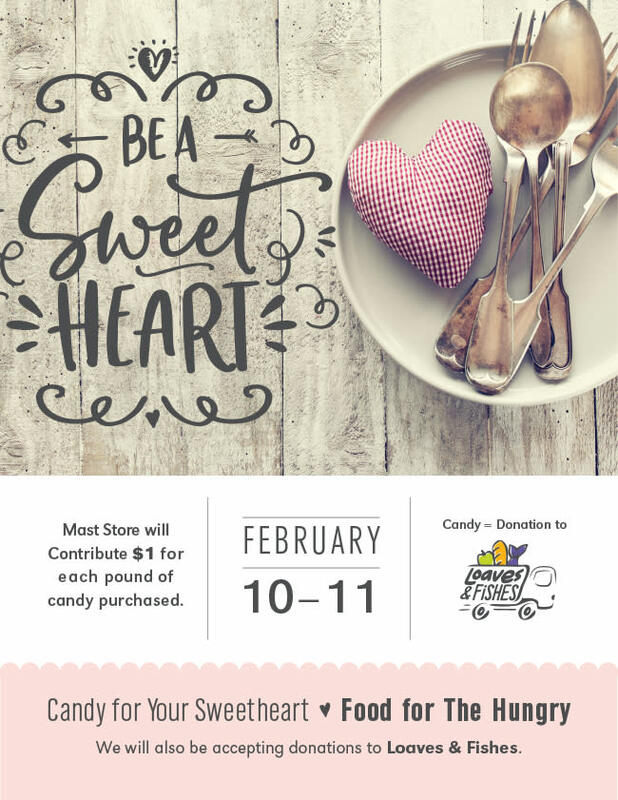 The annual Be a Sweetheart, Feed the Hungry campaign matches each pound of candy purchased at Mast Store with a $1 donation, which will provide four meals for someone in our community who is hungry. For each pound of bulk candy purchased, Mast Store donates $1. Through partnerships and community contributions, Loaves & Fishes is able to stretch $1 into four meals. Guests can make a difference without a candy purchase. Change collection jars are at each register, so donating the change from your transaction can make a big impact on someone’s life. Hunger does not discriminate and is not just an issue within the homeless community. There are many reasons an individual or a family turns to food security organizations for help – loss of a job, unexpected medical expenses, taking care of extended family members, etc. Loaves & Fishes’ mission is to eliminate food insecurity among our neighbors by working to ensure no good food goes to waste. Through a network of donors (restaurants, caterers, grocery stores, etc. ), drivers specially trained in food handling procedures pick up fresh foods and deliver them to over 90 partners including senior centers, child care facilities, and soup kitchens, which serve over 275,000 individuals. Like many non-profit organizations, Loaves & Fishes relies on volunteers and donations for much of its success. There are opportunities to get involved on a personal or group level. Learn how to fight hunger in your community. Stop by the information table during the event or click over to their website at www.LoavesandFishesGreenville.org.